Ruth and Rosamund Everard where the daughters of Bertha Everard, who with Bertha's sister Edith King, made up the remarkably creative family of women painters who lived in Mpumalanga (formerly Eastern Transvaal) during the first half of the 20th Century and became known as the Everard group. Isolated from artistic communities and living in a rural location, the extraordinary output has only recently received renewed attention and their significant contribution to South Africa art history acknowledged. Ruth was the first daughter of her artistic mother, Bertha Everard and was born in 1904 at Nottingham Road in KwaZulu-Natal. In 1919 she attended Eunice School in Bloemfontein where her aunt Edith was Headmistress. 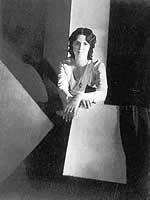 From 1921 to 1922 she attended the Cape Town School of Art before enrolling in the Slade School of Art in London. Ruth found the conservative English art format restrictive and moved to Paris in 1923 where she was based until 1926. She traveled with her mother and her aunt to various European destinations while studying art at various studios. In 1929 she married Denholm Haden and the couple settled on the family farm 'Bonnefoi' and later 'Riverlands'. Her grandchildren were to spend idyllic school holidays on the farm and recall Ruth's passion for farming, horse breeding and animals. Ruth worked in oil and watercolour to produce mainly landscapes, in addition to still life and portraits. Ruth was influenced by the new movements in European art such as Cubism, Vorticism, Futurism and the work of earlier Expressionist painters. Her work is confident, bold and controlled using simple outlines to convey shape and format. She stopped painting in 1956 because of failing eyesight. Ruth exhibited her work in South Africa through the 1930s, 40s and 50s participating in the Everard Group exhibitions of 1931 and 1935, the Overseas Exhibition of South African Art which toured from 1948 to 1950 and the historical exhibitions to mark van Riebeeck's Tercentenary in 1952 and Pretoria's Centenary in 1955. The Tatham Art Gallery's Everard Group Retrospective drew attention to the artistic talent of the family and this was bolstered by 'The Everard Phenomenon' exhibition which toured South Africa in 2000.